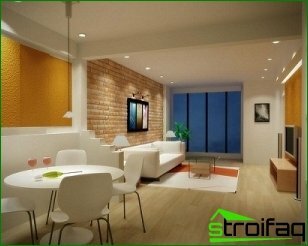 The quality of lighting depends on many components- Used lamps, lamp power, select their location, etc. Not just buy a table lamp luminaire for ceiling, wall sconces, etc., it is important to consider in detail all the points. Only in this way we can achieve the desired result. It is important to understand that even in the presence of the windowaperture and using one light source, desired light amount may not be obtained. The optimal solution would be the organization of a three-level lighting. If the room is small, then it is possiblerestrict overhead lighting. 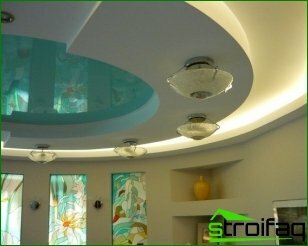 For his organization will be enough of one ceiling light, but if the budget and room size allows, then it is better to install lighting on a few lamps. Or near a mirror in another work areapreferably equip the working lights. You can arrange several light devices. Many find the topical use of lamps on flexible brackets, thereby creating the opportunity to direct the flow of light in the desired direction. This is very convenient when performing cosmetic or hygiene. 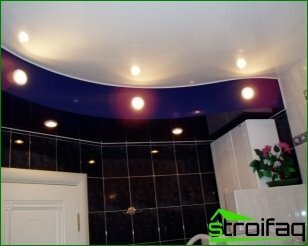 The functionality of the lower lighting is low,but it will create the desired decorative effect. It can help you achieve the desired design space, decorated with niches or pedestals. It is also possible to use the integrated illumination as portholes and lanterns with different colors. 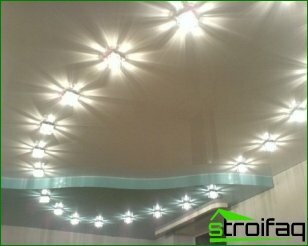 Lighting, housing which is made ofplastic or colored glass can distort light. 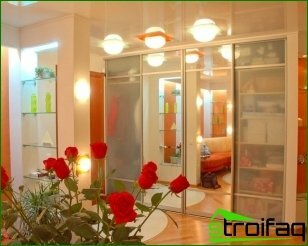 For this reason, some prefer gated ceiling lamps, made of transparent or opaque white material. 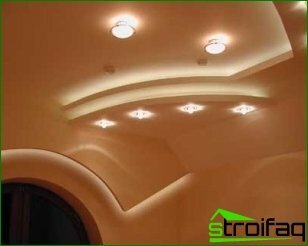 When selecting the instrument lighting is important to consider the height of theceiling area of ​​the room in which it will be installed. For example, if the ceiling is low, then by hanging chandeliers have to give them an effective substitute for point and wall and ceiling lamps and spotlights. In a small room will look ridiculously extravagant chandelier with multiple shades. As you can see, choose the right lighting is notalways easy, it requires time and attention. However, the reward for such efforts will be an excellent interior, as well as the convenience of living. And it's worth all the effort! 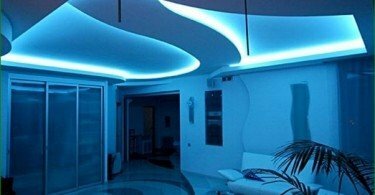 LED Strip - what is it?